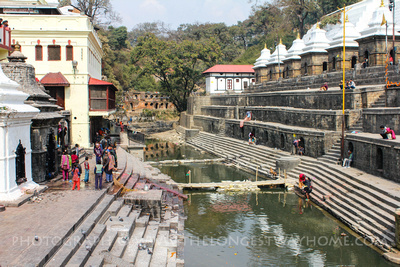 Pashupatinath (Pasupatinath पशुपतिनाथ मन्दिर) is located along the banks of the Bagmati River in the eastern part of Kathmandu city, close to Kathmandu airport. 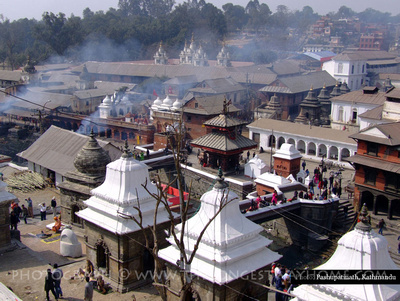 Click photo to see a larger photograph of the Pashupatinath temple complex! 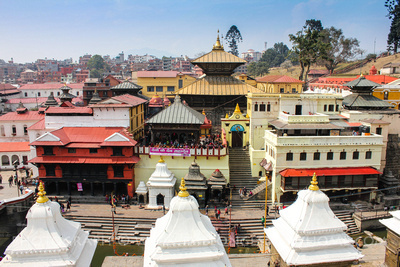 Within the complex is the famous Pashupatinath Temple the oldest Hindu temple in Nepal dating back to the 5th century. While the main Pashupatinath temple interior is off limits to non-Hindus (foreigners/tourists) there's quite a bit to see and experience around the rest of the area. Ritual cremations occur daily along the riverside and a can be a sight to behold for those who have not seen Hindu cremations before. 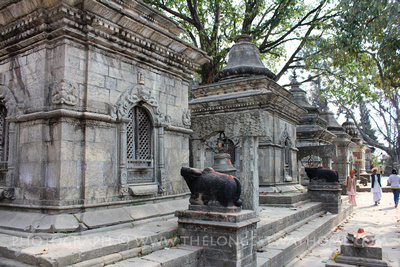 While on the opposite side of the river are a host of smaller stupas (chaityas) and temples where mystic Sadhus often gather. It's important to note that many "tour guides" don't bother showing tourists most of this complex. 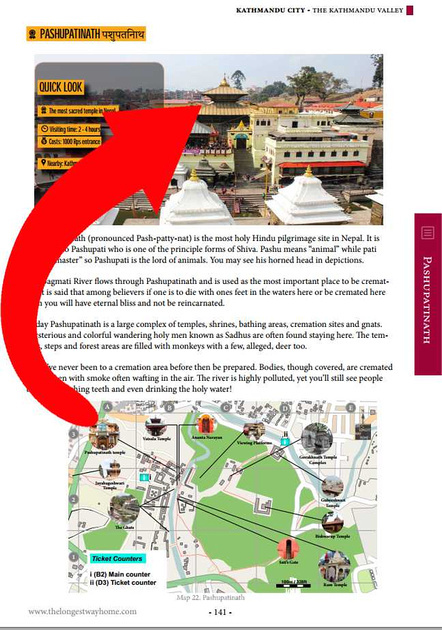 Do read on to discover more and read my Nepal guidebook to get more details on Pashupatinath than anywhere else. The original Pashupatinath temple was destroyed by termites and the new/current one was reconstructed over it in the 17th century. Every year between February/March there's a festival to celebrate Lord Shiva known as Shivaratri (check out the post to find out what to expect). The dates change annually but the crowds keep getting larger. Well worth attending if you can stick the crush. The most popular legend has it that Pashupatinath came about when Lord Shiva stopped for a rest in the area and took the form of a deer. He lived the area so much he did not want to leave. Shiva then became known as Pashupatinath, Lord of all Animals. Legend then grew further that whoever came there to worship him would not be reborn as an animal - an important consideration within believers of reincarnation. Today within the "forbidden" section of the temple is a large Shiva lingam which represents the "exact" place where Shiva once lived. This is also the ''head" of Shiva from the twelve Jyotirlinga. The rest of these 12 body representative parts are in India. Pilgrims will try to visit all these parts of Jyotirlinga including this one in Kathmandu which often happens during Shivaratri (festival to mark Shivas birthday). This Shiva Lingam is also part of the 275 Tamil based Paadal Petra Sthalams or Holy Abodes of Shiva which are spread out across the continent of Asia. While the exact date of the main Pashupatinath temple is not known historians say it was built most certainly in the 5th century but probably closer to 400BCE. One fact is that there is an inscription by Supuspa Deva, a Lichchhavi King dated 753 CE, which lays claim to the king building the original wooden temple. However a legend states that the lingam was there before this and King Supuspa Deva built a five storey temple over it. A King named Shivadeva in the 12th century is said to have reconstructed the temple again in wood. Then in the 13th century King Ananta Malla built the elaborate roof during the great artistic period of Nepal. Later this wooden temple was damaged by termites and fully rebuilt in the 17th century. For any tourist visiting the Pashupatinath complex it's important to realize that it a "complex" and not just a single temple. That's one of the reasons tour guides fail so miserably to make the effort in exploring the entire areas - it's huge! So most just show the outside of the Pashupatinath temple (because you can't go in!). And, the ghats or cremation area. So it's far better to bring a written guidebook with you than to hire a guide for this area. Beware of the monkeys - they steal food, shiny objects and will take things from your hand or bag! For any non-Hindu tourist it is not possible to enter into the actual Pashupatinath temple itself. Hindus can enter but no photographs are allowed. There's strict security with metal detectors so don't even try. There are lockers to put your valuables. For all others here is a description of what's inside. You enter through a huge arched gate where a large bronze/golden Nandi (Shiva's mount) kneels before the temple. The pashupatinath temple itself in the middle of an open courtyard in the form of a typical Nepali (Malla inspired) square two-tiered pagoda style temple built on a single-tier plinth. It stands at 23.6m (77.4 feet). There are four doors and each is ornately decorated in gilt and silver-plates. The wood roof struts under the first brass roof tier show wood carvings of members of Shiva's extended family. These include Parvati, Ganesh, Kumar, Hanuman, Ram, Sita and Lakshmi. Inside the first door is the outer sanctum which is a narrow corridor around the inner sacred sanctum. The inner sanctum has a large one meter stone lingam based on a silver Yoni which is surrounded by a Nag (serpent). The Lingam has four faces of Shiva representing Sadyojata or Barun, Vamdeva or Ardha nareshwor, Tatpurusha, Aghor & Ishana who is made from the imagination. These also represent the earth, water, air, light and ether. Each of the faces has small hands showing Rudraksha (Shivas tears - read more about these on where to buy beads in Kathmandu including Rudraksha) on one side and a Kamandalu (water pot) in the other. This Shiva Lingam is also dressed in a golden dress. So the ritual of pouring milk over the Lingam is not performed continuously but only during a puja (Abhisheka) by the four devoted priests of Pashupatinath. The lingam is only viewable from 5am to 12 noon. The only priests allowed to touch the Shiva Lingam at Pashupatinath are four Bhatt or Bhatta priests who were ordained in India. The others are Bhandari priests who are helpers and caretakers that are not allowed to touch the lingam. 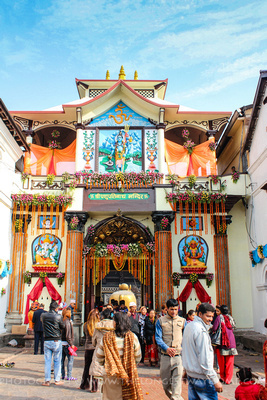 This part of the main Pashupatinath complex is open to all who have bought an entrance ticket. The Ghats - various areas surrounding the Bagmati river where cremations occur. Each Ghat has a separate meaning all of which is shown in my guidebooks along with the following and more. Vatasala Temple - with a shrine to Bhairab. Guhyeshwari Temple - another off-limits temple to non-Hindus it is where Sati's Yoni is. All the above are are rarely fully visited by local tours guides but are described in-depth with photographs and maps in my guidebooks to Nepal. The current fee for foreigners is 1000rps. The ticket office is close to the river by the main road. There are other "security" ticket offices opening up on the other side of the river. During Shivaratri the ticket price remains 1000rps but with huge queues and devotees offering additional fees to get priority queuing preferences. Hindus wishing to partake in Abhisheka or Puja need to pay 1100 rupees (yes, it's controversial), at the ticket counter near the main temple entrance. Opening times for the main Pashupatinath complex are from 4am to 9pm. The Pashupatinath temple is open from 9:30am to 1:30pm (same and the puja/abhisheka ticket counter). The inner sanctum and Shiva Lingam are open from 5am to 12 noon. Do note that In the evening there is ritual singing along the ghats. Walking: It's quite a long walk to Pashupatinath from Kathmandu city center. I'd really only advise it is there is a strike on and there's no traffic around. Otherwise it can be a dirty dusty trip. A better option would be to walk from Pashupatinath to Boudhanath which is very close (20 mins) and then take a taxi or bus back. By bus/taxi: It's about 15 minutes from Thamel in non-rush hour. Taxi's will try to overcharge, set the price before getting in with a friendly bargain. Average price is about 200 to 250 rupees.